The following document was obtained from the public website of a law enforcement partnership organization. (U//FOUO) We assess that a Shia homegrown violent extremist (HVE) attack in the US is highly unlikely absent a catalyzing event that could galvanize some US-based Shia to engage independently in violence. Given sustained bilateral US-Iran tensions, the occurrence of such a catalyst could prompt Shia HVE activity relatively quickly, underscoring the benefits of early engagement with Shia communities about indicators of HVE radicalization. 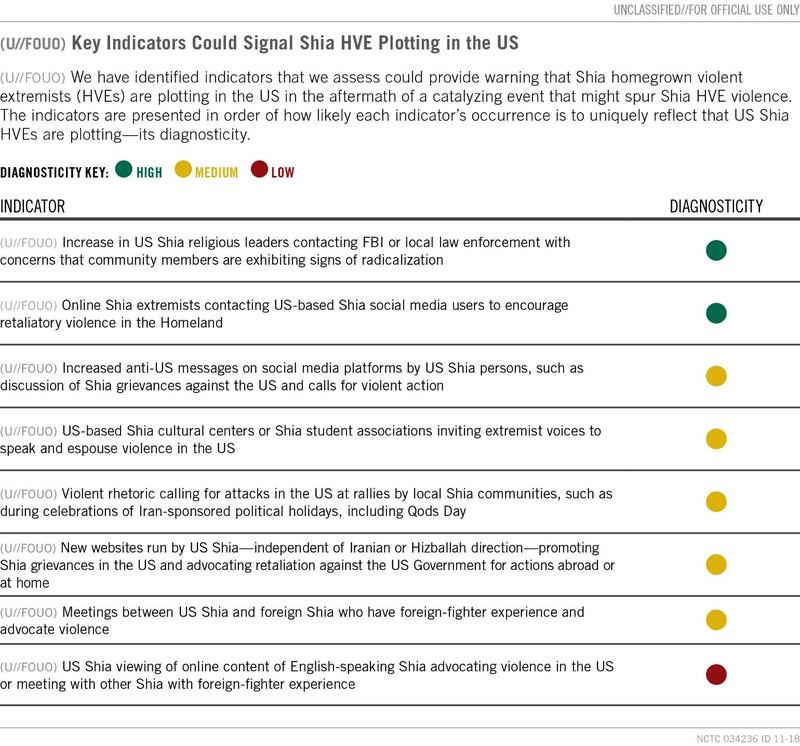 Potential triggering events for such Shia HVE violence include US military action against Iran and Lebanese Hizballah, Shia leadership or senior clerics sanctioning violence in the US, prominent Sunni government attacks on Shia, or high-profile anti-Shia activity in the US, judging from the results of a structured NCTC brainstorming exercise. (U//FOUO) There are no confirmed cases of Shia HVEs who plotted attacks in the US, probably because support for fundamentalist ideology is less prevalent among US Shia than US Sunnis, the hierarchical nature of Shiism, and the absence of a violent triggering event against Shia overseas or in the US. Even if Shia HVE plotting were to emerge, the pool of Shia HVEs would be smaller than that of Sunni HVEs, limiting the scale of the potential threat. (U//FOUO)We identified three key enablers that would probably increase the likelihood of Shia HVEs mobilizing to violence in the wake of a catalyzing event: the emergence of charismatic US-based Shia extremist voices, a persistent online Shia extremist cohort advocating violence in the US, and anti-US rhetoric from Shia media calling for violence in the US. (U//FOUO) Increased community outreach to Shia community groups, mosques, and student organizations in the US about the signposts of extremist behavior could lead to the identification of future plotters and improve efforts to steer those individuals away from violence. (U//FOUO) Many existing law enforcement tools available to help thwart HVE plotting would be applicable to efforts to help identify and mitigate potential plotters, many of whose preoperational behaviors would probably resemble those of other HVE plotters, judging from the results of the NCTC exercise. (U//FOUO) Shia HVEs would be more likely than other HVEs to favor targets symbolic of Jewish interests or the Israeli or Saudi Arabian Governments, judging from the results of the NCTC exercise. (U//FOUO) This Special Analysis Report explores the main global drivers that could lead to the emergence of US Shia HVEs and influence them to independently plot attacks in the Homeland. 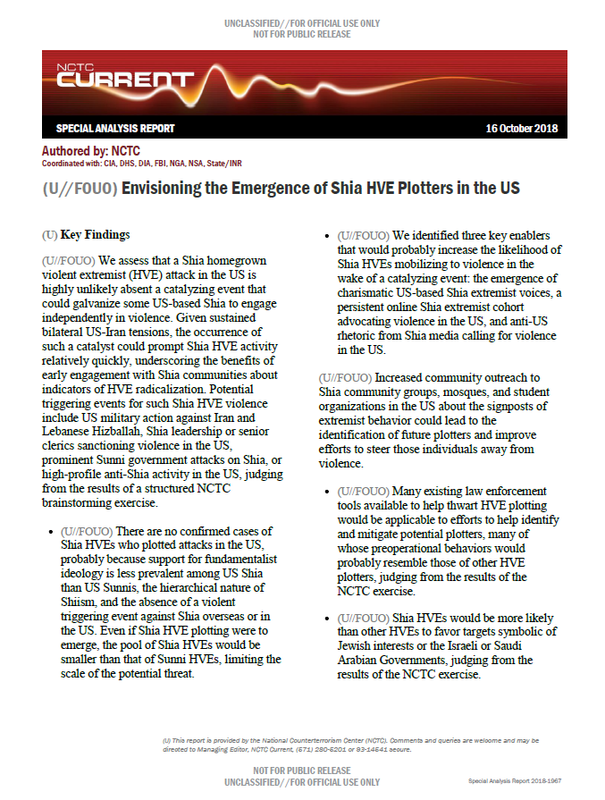 NCTC subject-matter experts on US HVEs, Iran, Hizballah, terrorist propaganda, and terrorist cyber actors conducted a structured analytic brainstorming session to explore the potential for Shia HVE plotters to emerge in the US. (U//FOUO) We assess that US-based HVEs are frequently motivated to engage in violence by a range of factors, including personal issues, which are often difficult to predict or identify before they conduct an attack. Therefore, we cannot discount the possibility that a single Shia HVE plotter could arise at any time, motivated by a unique set of circumstances and individualized grievances. (U//FOUO) NCTC defines an HVE as a person of any citizenship who has lived and/or operated primarily in the US and advocates, is engaged in, or is preparing to engage in ideologically motivated terrorist activities in furtherance of political or social objectives promoted by a foreign terrorist organization but is acting independently of direction. For the purposes of this assessment, we further define Shia HVEs as individuals who are inspired or influenced by state actors such as Iran, foreign terrorist organizations such as Hizballah, or Shia militant groups but who do not belong to these groups and are not directed by them. (U//FOUO) We have identified four catalyzing events that would probably inspire some Shia to engage in violence here without any explicit direction from the Iranian Government, Hizballah, or Shia militant groups. Although some of these events have occurred in the past without the emergence of Shia HVEs in the US, we assess that repeat occurrences of such incidents could contribute to or spark radicalization, judging from the results of the NCTC exercise. (U//FOUO) US Military Actions Abroad Against Iran, Hizballah, or Shia Militants: Direct US military action in Iran, sustained US operations against Hizballah in Lebanon or Syria, or the assassination of a senior Iranian or Hizballah leader perceived to have US involvement would be significant events that might push some US Shia to radicalize and consider retaliatory violence. (U//FOUO) Shia Leaders and Clerics Call for Violence in the US: If Iran’s Supreme Leader removed the prohibition on conducting attacks in the US, the Supreme Leader or Hizballah’s Secretary General called for attacks against the US, or senior Shia clerics issued fatwas urging attacks in the US, some US Shia might feel justified in conducting an attack here. Iranian Supreme Leader Khomeini issued a fatwa in 1989 calling for UK author Salman Rushdie’s death, and Iran state-run media issued a $600,000 dollar bounty on Rushdie in 2016, but there have been no confirmed attempts on his life. (U//FOUO ) Israeli Government or Sunni Killing of Shia Individuals: If the Israeli or Saudi Government, or another Sunni government perceived as anti-Shia, conducted a large-scale lethal operation against Iran, Hizballah, or other Shia, Shia worldwide could respond with outrage that might serve as a triggering event for US-based Shia. (U//FOUO) Anti-Shia Activity in the US: A prominent or deadly attack in the US against Shia populations or symbols could spur retaliatory attacks against the perpetrators or a target perceived as complicit or accepting of the anti-Shia activity. Events such as disparaging depictions of Shia religious leaders that Shia Muslims perceive to be inflammatory and denigrating to their beliefs in the US could motivate some US Shia to become receptive to calls for violence.